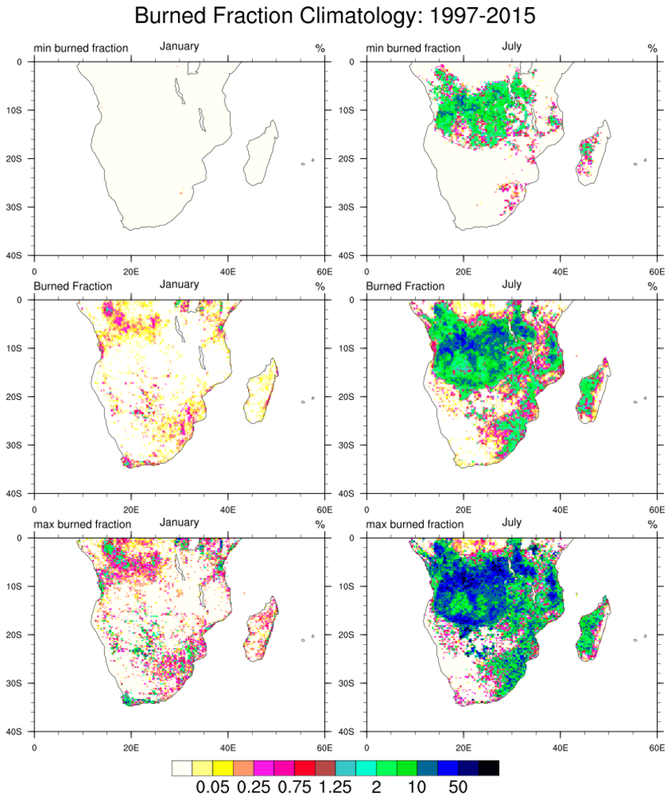 The Global Fire Emissions Database (GFED) provides "combined satellite information on fire activity and vegetation productivity to estimate gridded monthly burned area and fire emissions, as well as scalars that can be used to calculate higher temporal resolution emissions." 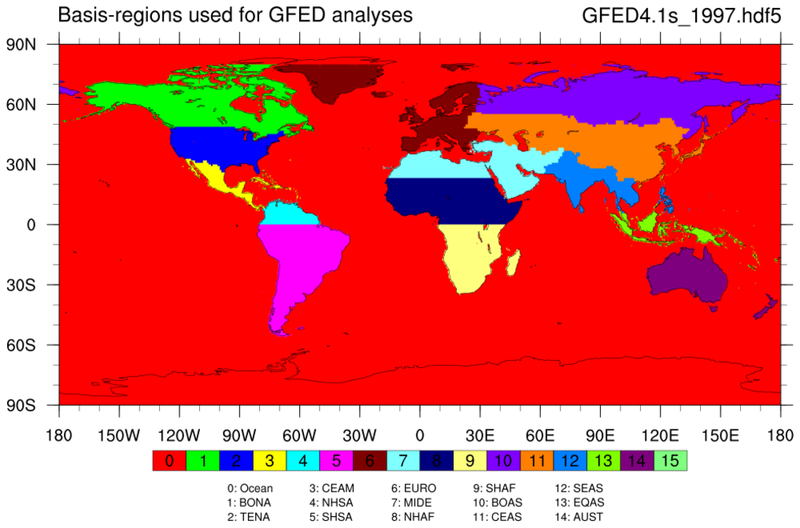 The GFED files are archived in HDF5 format. NCL's ncl_filedump (here) or Unidata's ncdump -h (here) may be used to examine a GFED's HDF5 file's contents. The information on each output files is the same. However, there are some differences in the presentation. For NCL applications, it is recommended that users use the ncl_filedump as a reference because that is how NCL 'sees' the file. The hdf5 file structure uses multiple embedded groups. 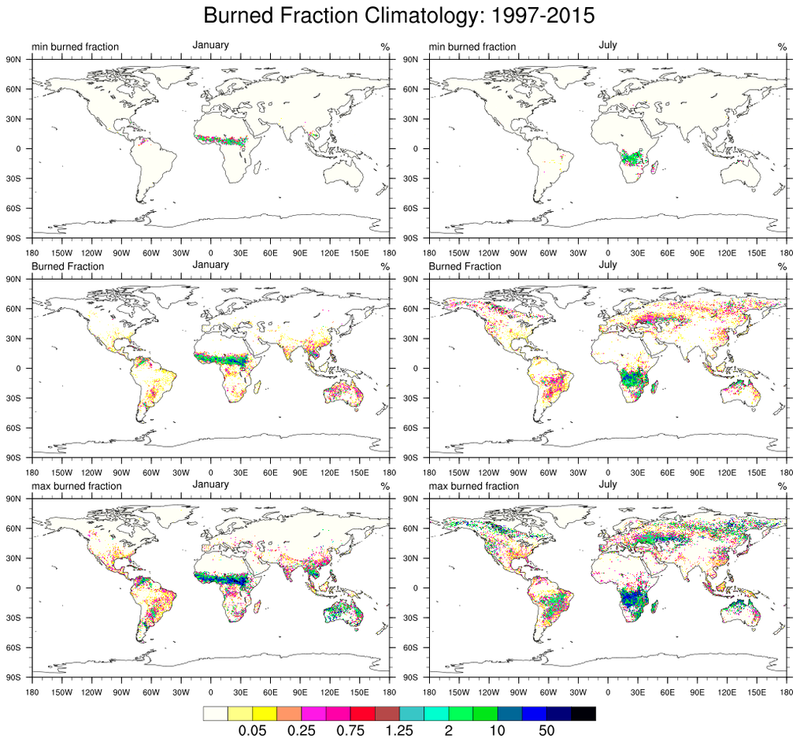 The group names are: ancill, biosphere, burned_area and emissions. The latter three groups are further enclosed within monthly groups named 01, 02,...,12. Each monthly group contains several variables. Lastly, the emissions group has a sub-group named partitioning which contains category emissions. 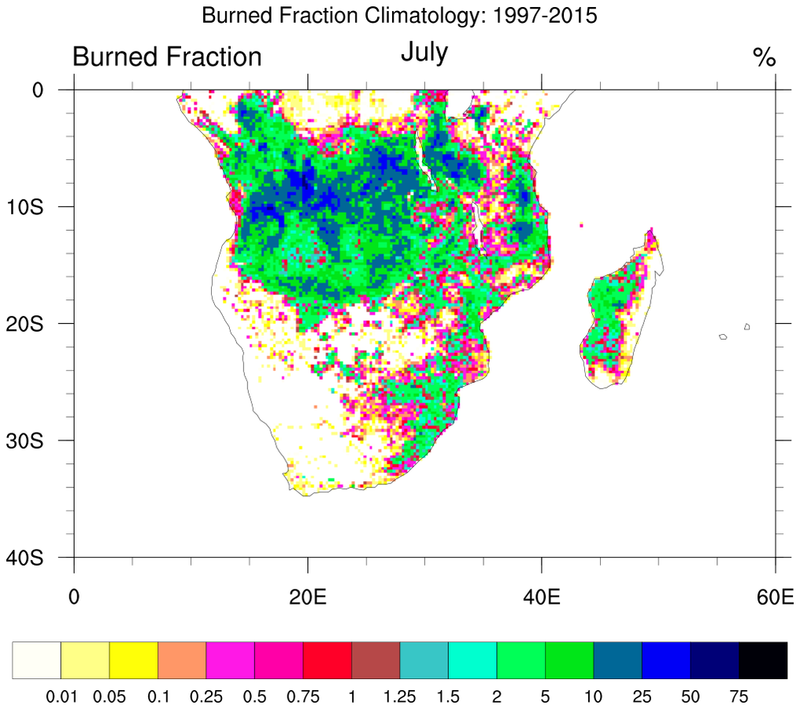 Please also see the Climate Analysis Section's Climate Data Guide for further information on the monthly products. Search for GFED. 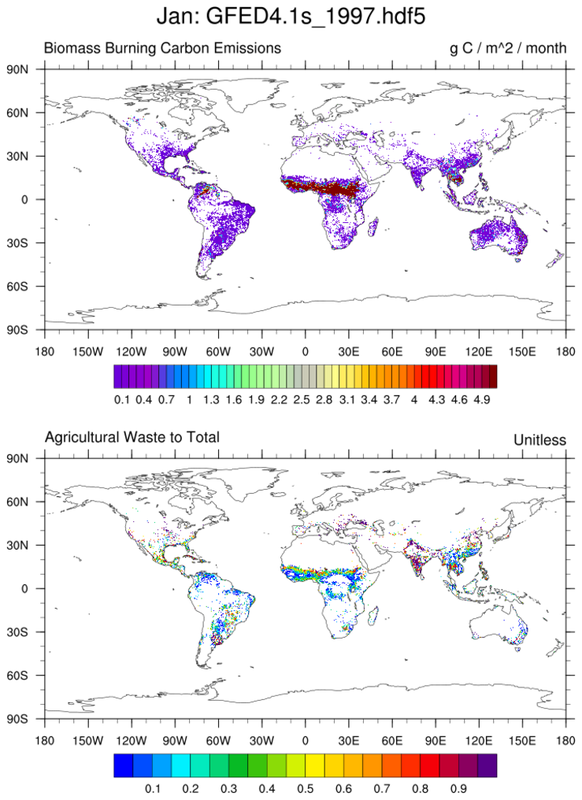 gfed_1.ncl: Read the GFED 'basin_regions' from the hdf5 group named ancill and plot. gfed_2.ncl: Open a GFED hdf5 file; read and plot specified variables from different groups. This example uses the where function and the variable basis_regions contained within the ancill group to mask areas. The stat_dispersion function is used to examine the variable's distribution. gfed_3.ncl: Convert all yearly (12 months) GFED HDF5 files [GFED4.1s_YYYY.hdf5] to netCDF-4 to facilitate use for CESM post-processing. Specifically, a source file named 'GFED4.1s_1997.hdf5' will yield a corresponding netCDF-4 file named 'GFED4.1s_1997.nc'. gfed_4.ncl: Use NCL as a scripting language to invoke the netCDF operator (ncrcat) to create single-variable netCDF-4 files. A sample ncdump -h of a GFED single-variable netCDF file is here. gfed_5.ncl: Open a single variable netCDF-4 file containing data for all years (See Example 4). Compute and plot: (a) monthly climatology and (b) the minimum and maximum values over all the available years. 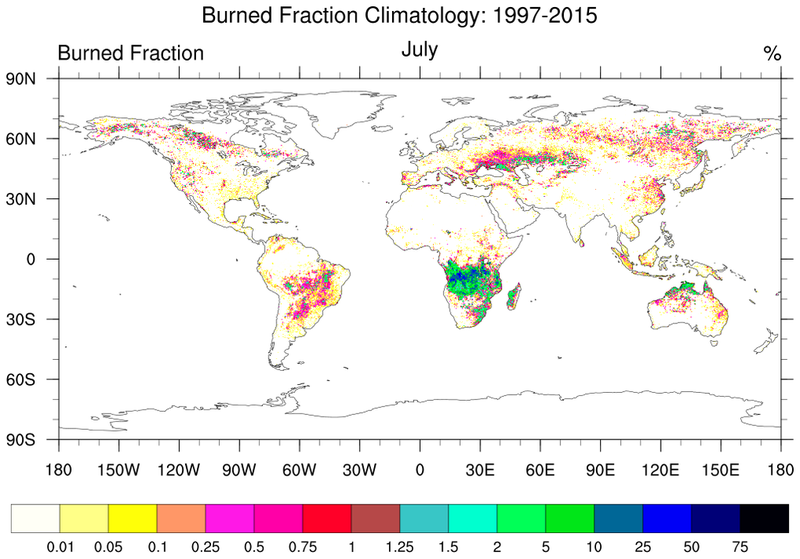 The left plot shows the climatological JULY "burned fraction (%)." The right figures shows the climatological minimum (top), mean (middle) and maximum (bottom) for January and July. gfed_6.ncl: Open a single variable netCDF-4 file containing data for all years. Specify a region; use 'basis-region' to extract only desired variables; extract and plot. 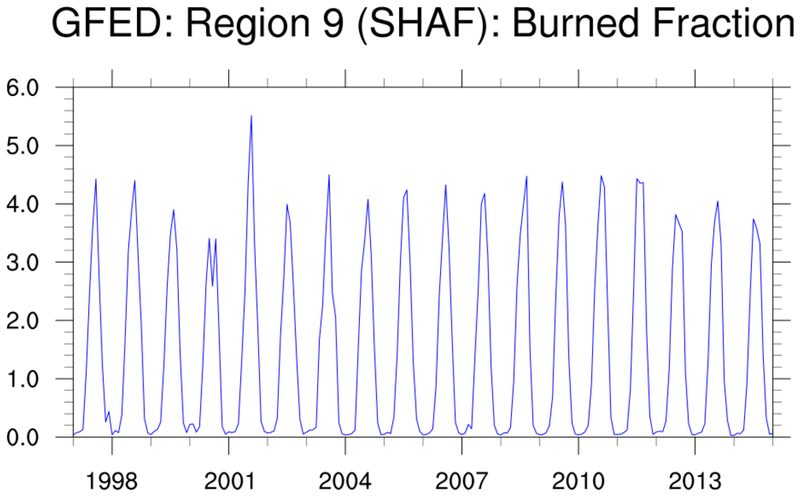 Compute and plot: (a) monthly climatology and (b) the minimum and maximum values over all the available years. Also calculate and plot the areal average (wgt_areaave2 using the 'GRID_CELL_AREA' variable for each time step).